In 1994, there were just a few thousand websites on the internet. HTML was still new, and the concept of web publishing was still embryonic. 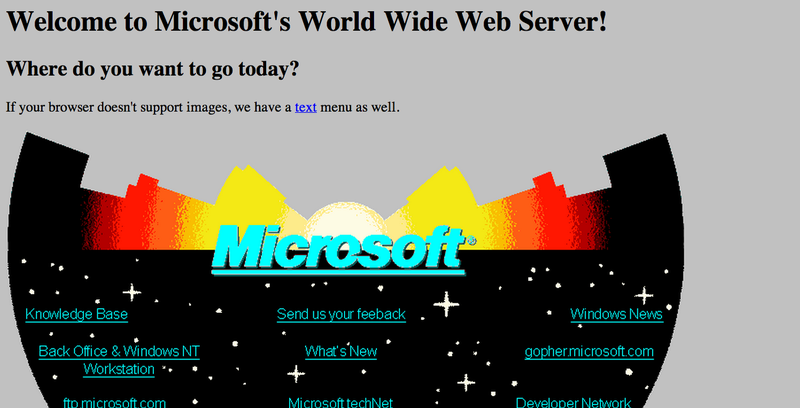 It was the year that Microsoft launched its own website—and today, to celebrate its 20th anniversary on the web, the company dug that old website up and put it back online. The original Microsoft website was a somber, textured grey affair dominated by a big starburst graphic that must've looked futuristic to the web audience 20 years ago—it's straight Geocities chic. According to the developers tasked with recreating it, the process was "sort of like an archaeological dig, digging through dinosaur bones, to find out how they did this then:"
It seems really simple, but we had to kind of peel back the years and go down to 1994 technology – where your browser doesn't support images, for example. In 1994, it was more of a triumph to have a Web page in and of itself, whether or not an image was attached.